No barnyard's complete without a pig pen. It's just a fact that porcine presence is necessary for the complete farm experience, and you can't beat a Yorkshire for optimal “pigness.” Dubbed the Large White in the UK, the Yorkshire is a longtime favorite of hog farmers for her hardiness and mothering abilities. For the rest of us, the Yorkshire is one classic pig with her long frame, considerable girth and spotless, pink skin. The origin of the Yorkshire pig is difficult to pin down, as hog breeding in the 19th century wasn't a heavily-documented affair, but we do know that the Large White was first recognized in 1868 and established as a founder breed in 1884 by the National Pig Breeders' Association. The pig, originally bred to be an active outdoor animal, quickly gained popularity for her high-quality meat and as a cornerstone of cross-breeding endeavors. 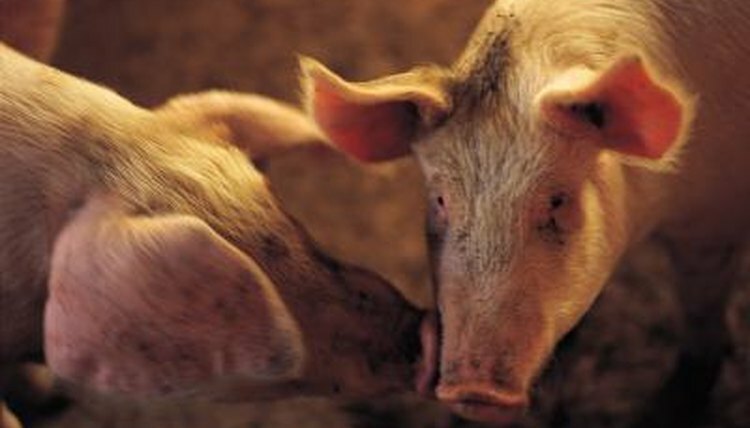 A sow's life expectancy of 6 to 10 years adds to her appeal as a mothering swine. If you're ready to commit to a Yorkshire for her upwards of 10-year lifespan, you can rest assured you've chosen an attractive compliment to the farmstead. Her long body is covered in thin, white hair atop classically pink pig skin, with upright ears and a broad, dished face. The Yorkshire is a social, intelligent companion as well, one that adapts quickly to the presence of humans – a handy trait, as her constant search for food can be an entertaining spectacle. Some Yorkshires even have been described as “affectionate,” though caution always should be exercised when interacting with an animal of such extreme size. While a Yorkshire pig can live an average of 6 to 10 years, some common conditions sometimes cut that time frame short. Her notable weight – a mature Yorkshire can weigh in excess of 650 pounds – may cause strain and have deleterious health effects that shorten her life. In addition, pigs are susceptible to respiratory illnesses, like bronchitis and pneumonia, influenza and parasite infection. It's also true that most Yorkshires will never see the full life span because, as a meat animal, the pigs typically go to slaughter around 6 months. While she looks like an interesting companion animal and likely is smarter than man's best friend, a Yorkshire pig really isn't pet material and should be left to hog farmers to raise. The breed's mature weight is far too large for a suburban backyard, and her specialized care requires experienced livestock handlers. Experts suggest porcine-curious homeowners look into potbellied pigs, with a much more manageable size, but a functioning farmstead with appropriate pig accommodations can enjoy up to a decade of pig pleasure with a Yorkshire. Right Pet: Is the Yorkshire Pig the Right Breed of Pig for Me?